School Education Dept of Telangana State has decided to conduct 1st Teachers Eligibility Test in Telangana afer formation of Telangana State. Lakhs of aspirants are waiting for Teachers Recruitment (DSC) in Telangana at the same time So many have completed their Teachers Training who are eager to get eligibility for DSC with TET as Govt has not conducted TET after formation of Telangana. So Process Started for DSC in Telangana. 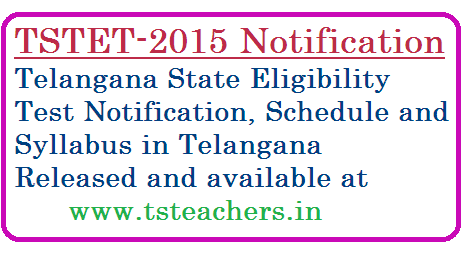 As per Govt sources TSTET-2015 Notification will be released on 16.11.2015 and examination will be conducted on 24.01.2016.